NOTE: This is an Adult Title. 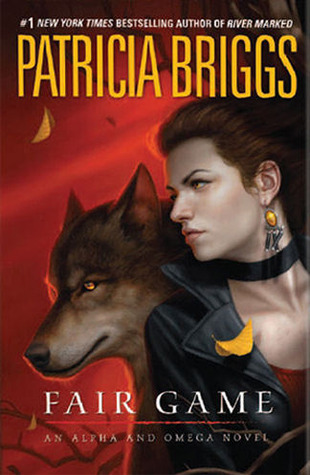 Review: 5 Stars - Fair Game, the third book in the Alpha and Omega series by author Patricia Briggs has been a highly anticipated book since the turn of the last page in Hunting Ground. It didn’t disappoint! Charles and Anna have been through a lot in what feels like such a short period of time. And in the third installment I found myself asking if they’d ever really get a break? Charles is his father, Bran the Marrok’s assassin. And with the human world finding out there are more things living among them, Bran has to force a stricter policy when it comes to keeping all the werewolves in check. It’s a hard job for one person to do, but his father has no choice and he knows that Charles is good at his job because of the years he’s been doing it. What Bran doesn’t know the damage it’s causing his otherwise strong son. Anna knows there’s something wrong with Charles. He’s been distancing himself for a long time now and she knows it’s at the hands of the tasks of his job. She just doesn’t understand the full extent of the problem. The wedge that’s being pushed between them is getting bigger and bigger and if she doesn’t do something she’s scared she’s going to lose Charles forever. Bran finally gets the picture and sends the two to Chicago to help the local pack and government try to figure out who’s killing werewolves and fey and he’s hoping that the same time it’ll help to heal his son and repair the damage he has caused. Anna and Charles have one of those relationships that feels real, with real struggles and issues. They might be werewolves, but their human side comes through and they feel like a normal couple. Briggs has a knack for writing her otherworldly characters in such a fascinating way and you can’t help but grow attached to them. It’s thanks to this fantastic writing and story lines that I’ve become invested in the lives of Anna and Charles. These two know each other and Briggs has found a way that it often feels as though they are dancing on the page as they work through their issues and come to each other’s aid. As always Briggs also knows how to bring the action and let me tell you, there was no lacking on that throughout the story. The addition to the FBI and the whole tech side of this one was amazingly interesting! All in all, I am a HUGE fan of Briggs and her writing. Her story telling and characters are a breath of fresh air in the adult supernatural and paranormal genre. From the first novella right through the now third book in the series, Briggs knows just how to keep her readers read and wanting more. If you haven’t picked up this series, you should defiantly give it a try. Start with either the novella in On the Prowl to find out just how Charles and Anna meet, or pick up the first book in the series – Cry Wolf and you’ll see just why I have so much love for this amazing author and series. Happy reading.